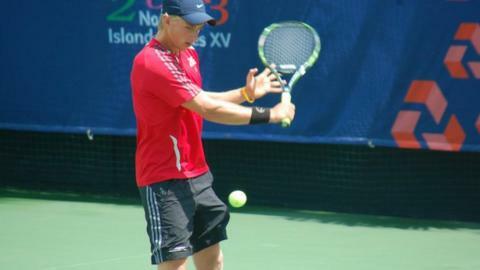 Island Games medallist James Connelly strolled to a straight sets win over Scott Weaver to clinch the summer Jersey Open. Number one seed Connelly only lost five games in the singles all week, and won the final 6-1, 6-2 at the Caesarean Tennis Club. "I'm feeling very good and very confident," he told BBC Radio Jersey. "I got off to a good start and broke him in the first game and I just tried to keep the pressure on." He later added to his Jersey Open success by claiming the men's doubles title, again at Weaver's expense. Connelly teamed up with St Clement player Grant Collins to overcome Weaver and Tim Shute in straight sets 6-4, 7-5.